Listen to The National Archives podcast here and YouTube videocast here. See also BBC Magazine feature: ‘Are UFOs linked to sci-fi films?’ (17 August 2009); The Guardian Data Blog: ‘UFO Sightings: The Will Smith Effect Examined’ and ‘The British X-Files in full‘ (18 August 2009). The official website also includes a link to a flier for my new book The UFO Files – The Inside Story of Real Life Sightings. The book is published by TNA in September and covers the key sightings and official commentary drawn from the British Government archives from WW1 to the present day. But what does this fourth tranche of MoD papers contain? Well, the collection includes a hefty correspondence file (DEFE 24/1970) containing letters to MoD from MPs and a number of well-known UFOlogists between 1985 and 1995. There are complete dossiers on classic cases such as Rendlesham, the ‘Cosford incident’ and the Belgian UFO flap, along with six whole files packed with UFO sighting reports. The UFO reports files (DEFE 24/1959-1961, 1974-76) contain details of more than 800 individual sightings reported between 1993 and 1996, a year in which 609 UFO reports were logged by the Ministry’s UFO desk – the second highest total on record. In fact, there were more sightings during 1996 than all three previous years added together. As I have explained in the official press release, the most likely explanation for the unusual spike in numbers during 1996 and 1997 was that public awareness of UFOs and aliens was at an all-time high. Those years were the culmination of a period in which images of UFOs and aliens had saturated popular culture. During 1994-95 The X-Files TV series, shown on BBC2, was regularly pulling in 6 million viewers. In 1996 the release of the movie Independence Day, with its themes of hostile aliens in flying saucers and links to Area 51 and Roswell, was massively anticipated by the media. At that time I was working as a journalist on an evening newspaper and was personally responsible for at least three major features on UFOs and aliens. In addition to the film and TV coverage 1996-97 saw the release of a host of new books and media articles on UFOs and alien abductions. In the UK Graham Birdsall’s UFO Magazinebecame a news-stand publication and at least three other short-lived UFO titles were launched on the back of the X-files craze. 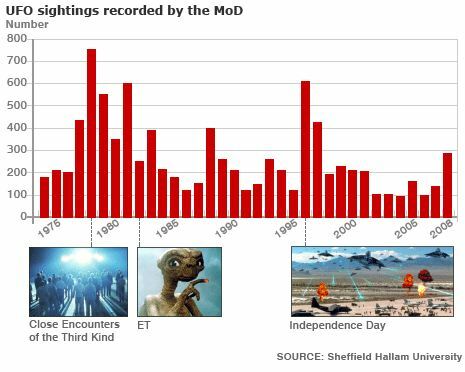 Aside from 1996, the busiest year on record for UFO sightings reported to the MoD over the past half century was 1978 – the year Close Encounters of the Third Kind was released. (MoD received 750 UFO reports in 1978, but 110 of those were directly related to the re-entry of the Russian rocket body, Cosmos 1068, on New Year’s Eve). But let’s get back to those lemon-headed creatures and their heat-ray. What is easily the stangest report uncovered by this 4th tranche of files came from Staffordshire Police who investigated a story told by two frightened youths who claimed they narrowly escaped abduction by a UFO occupant. Late on the night of 4 May 1995 the two ran into Chasetown police station in a state of excitement, calling on officers to come outside “and view a UFO that was still visible.” A PC and sergeant duly went outside and saw red and white lights in the sky which they believed was an aircraft. The police said both youths “appeared upset and shocked” so they asked them to go home and write a detailed account of what happened. They returned the next day with hand-written statements that were sent to the MoD’s UFO desk. The youth’s names have been redacted from their accounts, but they describe how they were walking along Rugeley Road, Burntwood, shortly before 11 P.M. when they both felt what one described as an “intense burst of heat”. Their skin glowed red and both were left gasping for air as sweat poured from their bodies. Then they saw the apparent source of the heat – a dark, silver disc-shaped object hovering about 40 ft away from them above a nearby field. The underside of this UFO appeared to be glowing red. As they watched in amazement a lemon-shaped head appeared between them and the UFO and both heard a disembodied voice call: “We want you, come with us.” Not surprisingly, they both ran for their lives! Full details of this weird incident, including the police report and the youth’s hand-written accounts, can be found in DEFE 24/1961 (pgs 191-207). A UFO armed with a heat-ray also figures in a second story, independently reported to MoD by police in Cheshire 14 months later (see DEFE 24/1976, p180). On reaching home he persuaded his father to return with him to the scene. At the location where the light beams hit the ground they found “four railway sleepers smouldering with a large hole 4” [inches] diameter burnt through one of the sleepers.” A police officer called to the scene reportedthe hole in the sleeper “does look rather odd” and was “still smouldering” five hours later. He could find no evidence of accelerants at the scene. In their brief report sent to the MoD, Cheshire police described the young man as “a sensible sort of lad and genuine”. This appears to be one of the very few UFO incidents recorded in the MoD files where physical evidence was left at the scene of a “close encounter”. But, as per normal, there is no evidence that anyone took samples from the scene or followed up this intriguing story. In fact, there is no evidence whatsoever to suggest these two incidents were subject to a follow-up investigation of any kind. Like the other 800 sightings that form the basis of this release, these reports were simply filed away and forgotten. And bear in mind these files would, pre-2005, have remained “secret” for 30 years under the old Public Records Act. The very fact they could not be opened to the public back then simply encouraged people to suspect the Government was trying to hide “the truth”. Now we can see what that “truth” actually is: they don’t have a clue what UFOs are and are not hiding any big secrets about aliens. Remember this is the British government, is that really surprising? But the truth, as John Keel once said, is the hardest thing to sell. The files and website are open to the public from Monday, 17 August and look certain to generate another flurry of media interest in UFOs. 48 files from a total of 160 held by the MoD have now been released in digital form by The National Archives. The transfer of files from MoD to TNA is due to end in 2011.